On Wednesday 24th October our Halloween Open Day will be held at Sutton Bridge Farm between 10 am – 3:30 pm. You can take a tour of Gowlands, our adults short break service and Roots and Shoots our horticultural project. 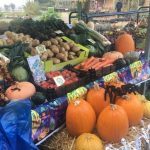 You can purchase fresh fruit and veg (including pumpkins!!) which are grown by the adults we support. You can also meet our animals, including Helga the farm cat. Refreshments will be available which will include warm homemade pumpkin soup. If you are able to attend you can be sure of a warm welcome.